This section deals with acute abdominal conditions that cause the patient to be hospitalized within a few hours of the onset of their pain. It is important to make the diagnosis as quickly as possible to reduce morbidity and mortality. Although a specific diagnosis should be attempted, the immediate problem in management is to decide whether an ‘acute abdomen’ exists and whether surgery is required. This should include previous operations, any gynaecological problems and whether any concurrent medical condition is prsent. The onset, site, type and subsequent course of the pain should be determined as accurately as possible. ‘Visceral’ pain due to distension of a viscus or stretching of a capsule is poorly localized. However, in general, upper abdominal pain is produced by upper gastrointestinal tract lesions and lower abdominal pain by lesions of the lower gastrointestinal tract. Localized pain in the right iliac fossa suggests acute appendicitis. Inflammatory conditions, e.g. appendicitis, produce a more gradual onset of pain while in intestinal obstruction the pain is typically colic in nature. With peritonitis the pain is continuous and may be made worse by movement. Vomiting may accompany any acute abdominal pain, but if persistent it suggests an obstructive lesion of the gut. The character of the vomit should be asked – does it contain blood, bile or small bowel contents? Any change in bowel habit or of urinary frequency should be documented and, in females, a gynaecological history taken. The general condition of the patient should be noted. Does he or she look ill? Is the patient shocked? Large volumes of fluid may be lost from the vascular compartment into the peritoneal cavity or into the lumen of the bowel giving rise to hypovolaemia, a pale cold skin, a weak rapid pulse and hypotension. INSPECTION. Look for the presence of scars, distension or masses. PALPATION. The abdomen should be examined gently for sites of tenderness and the presence or absence of guarding. Guarding is involuntary spasm of the abdominal wall and it indicates peritonitis. This can be localized to one area or it may be generalized, involving the whole abdomen. BOWEL SOUNDS. Increased high-pitch tinkling bowel sounds indicate obstruction; this occurs because of fluid movement within the large dilated bowel lumen. Absent bowel sounds suggest peritoneal involvement. In an obstructed patient, absent bowel sounds suggest strangulation or ischaemia. It is essential that the hernial orifices are examined if intestinal obstruction is suspected. Pelvic and rectal examination. These can be very helpful, particularly in diagnosing gynaecological causes of an acute abdomen, e.g. a ruptured ectopic pregnancy. 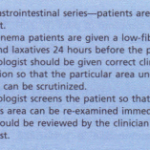 Rectal examination may detect localized tenderness or blood in the stools, which is suggestive of a vascular lesion. 1 Mouth-the tongue is furred in most acute abdominal disease and a fetor is present. 2 Temperature-fever is more common in acute inflammatory processes. (a) Blood-suggests urinary tract infection or renal colic. (b) Glucose and ketones-ketoacidosis can present with acute pain. (c) Protein and white cells (to exclude acute pyelonephritis). 4 Think of other conditions, e.g. (c) Myocardial infarction (referred pain). (e) The irritable bowel syndrome (this can produce acute severe pain). 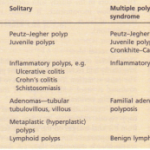 (g) Porphyria is a rare cause of abdominal pain. BLOOD COUNT A raised white cell count occurs with inflammatory conditions. SERUM AMYLASE High levels of greater than five times normal indicate acute pancreatitis. 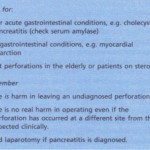 Raised levels below this can occur in any acute abdomen and should not be considered diagnostic of pancreatitis. SERUM ELECTROLYTES are not particularly helpful for diagnosis, but useful for general evaluation of the patient. X-RAY OF THE ABDOMEN. Chest and supine X-rays of the abdomen are useful to detect air under the diaphragm (perforation) or dilated loops of bowel or fluid levels suggestive of obstruction. ULTRASOUND-is useful in the diagnosis of acute cholangitis and in good hands is reliable in the diagnosis of acute appendicitis. Gynaecological and other pelvic causes of pain can also be detected. LAPAROSCOPy-is being increasingly used in the diagnosis of the acute abdomen when, in addition, therapeutic manoeuvres, such as appendicectomy, can be performed. This is the commonest surgical emergency. It affects all age groups, but is rare in the very young and the very old. Appendicitis should always be considered in the differential diagnosis if the appendix has not been removed. Acute appendicitis mostly occurs when the lumen of the appendix becomes obstructed with a faecolith; however, in some cases there is only generalized acute inflammation. If the appendix is not removed at this stage, gangrene occurs with perforation, leading to a localized abscess or to generalized peritonitis. Most patients present with abdominal pain; in many it starts vaguely in the centre of the abdomen, becoming localized to the right iliac fossa in the first few hours. There is nausea, some vomiting and occasional diarrhoea. Because of the variable position of the appendix, symptoms and signs differ. • Non-specific mesenteric lymphadenitis may mimic appendicitis. Yersinia infection also gives similar symptoms and signs. • Acute salpingitis-should be considered in women. There is usually a vaginal discharge and on vaginal examination adnexal tenderness is found. The appendix is removed by open surgery or laparoscopically. If an appendix mass is present, the patient is treated conservatively with antibiotics. The pain subsides over a few days and the mass usually disappears over a few weeks. Appendicectomy is recommended at a later date to prevent further acute episodes. There is virtually always some degree of localized peritonitis with all acute inflammatory conditions of the gastrointestinal tract, e.g. acute appendicitis, acute cholecystitis. 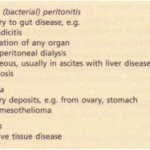 Pain and tenderness are largely features of this localized peritonitis. The treatment is for the underlying disease. This is a serious condition resulting from irritation of the peritoneum due to infection, e.g. perforated appendix, or from chemical irritation due to leakage of intestinal contents, e.g. perforated ulcer. In the latter case, superadded infection gradually occurs; E. coli and Bacteroides are the commonest organisms. The peritoneal cavity becomes acutely inflamed with production of an inflammatory exudate that spreads throughout the peritoneum leading to intestinal dilatation and paralytic ileus. In perforation the onset is sudden with acute severe bdominal pain, followed by general collapse and shock. The patient may improve temporarily, only to become worse later as generalized toxaemia occurs. When the peritonitis is secondary to inflammatory disease, the onset is less rapid with the initial features being those of the underlying disease. Investigations should always include an abdominal Xray to detect free air under the diaphragm and a serum amylase to diagnose acute pancreatitis, which is treated conservatively. treatment is with antibiotics and drainage is often required.